Silver Spoon is a genre about a subject which virtually no people I know care about. Slice of Life? Farming? In today's world, we don't really stop and consider the food we eat. Do you hate farming? Slice of Life? Well, this is still a perfect show for you. Why? It's well-grounded in it's main character, who has no idea what the heck is going on. The protagonist, Hachiken, is plagued by his father and older brother, the former expecting Hachiken to be like his brother, who is intelligent but dropped out of Tokyo University just to make his father mad. Like the majority of the viewers, not only have we been in Hachiken's shoes before, we may also know very little about farming. And that's okay. Hachiken's character is something a lot of us probably dealt with in our early years, especially for me as a kid who thought doing everyone else's work would make friends. Hachiken already has a full plate of problems, school, and the equestrian club he joins, but he still takes on his friend's problems, both public and personal, in an attempt to keep other people's dreams going while Hachiken attempts to find his own. Hachiken has zero experience in any farming related skill, which instantly makes him the perfect proxy for the audience. The show is ultra-acculturate to every part of farming, so you might even learn something from a couple episodes. Saying anything more after that would probably be a spoiler, and spoiler tags don't protect people from spoilers as much as we would think. Verdict? Watch it. Even if the SoL genre and the farming theme has scarred you for life, you'll definitely find peace in a show that's well-grounded in reality and know's who it's audience is. Who knows? Maybe you'll learn a thing or two. Sure its about modern farming and what goes with it but the feeling of hard work and growth as well as social aspects have the same feel. I get a good feeling after watching this anime unlike all the depressing hack n slash and overly sexualized animes this one is a is a nice breath of fresh air I approve! One of the best anime I've seen! Gin no Saji or Silver Spoon is a god tier anime. Why? No cliffhangers, comic relief, an MC who I can really relate with, a farm, farm animals, cute pigs, pork bowl, meat, amazing slice of life, and pork bowl. 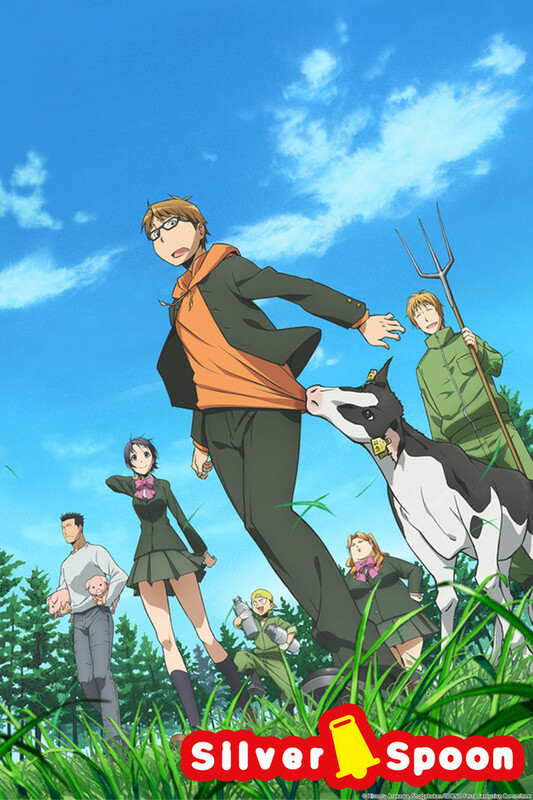 The anime follows a student who doesn't know what he wants to do in life and transfers from his old school, in the city, to a farming school to try and figure out what he want to do in life. Not only does this anime teach you more about life on the farm but it teaches you about the people behind the farms. The obligations of the next generation of the families, and how their children both accept and deny their succession of their farms throne. The students who love animals, but also has the fear of blood or hurting the animals. The kid whose mother is running a farm all by herself and wants to become famous so he can help his mother retire early, and that one guy we all know who knows everything about cars. All in all I give this anime a 5 stars because at the end of every episode when the amazing ED music plays I have a huge smile on my face as the credits roll. This series is fantastic. I was a big fan of FMA and thought that because this was slice of life I would not enjoy it, boy was I wrong. This is extremely entertaining and I would recommend it to anyone. The plot and characters are incredibly relatable and the setting is both refreshing and informative. Not really sure what else to add. Try it out. Its a very heartwarming anime that follows a city boy who ends up going to high school out in the country and learning about agriculture. It stays interesting. Its funny. It has a great cast of characters. The story is average and honestly felt at little boring a first, but as the series went on I ended up loving how a story so generic can be so good with all the little things on the side this anime provides. Just seems to be a heartwarming anime that will start off a little slow, but grow on you quick. Now that season one is over I can say that Silver Spoon is surely worth your times and will not fail to deliver every single episode. Silver Spoon is definitely around the top of my anime list. I've already watched season one twice and plan on reading the manga just to get more. The enjoyment from this anime for me was just immense. It left me in a good mood and feeling like going and doing something to improve myself.